I was reminded of the concept of cross training in sports while in the strangest place (best I not mention where I was). I was replaying the day's activities in my head which included offering demo rides and free introductory training for new riders at a rider safety summit sponsored by the Department of Natural Resources at Straddleline ORV park. After the summit, I joined a crew in the afternoon working on trail maintenance in Capital Forest located just south of Olympia. Volunteering to do this was well worth it. I got a chance to get dirty supporting the sport which included riding though the trails, removing downed trees, fixing wash outs and the like. Cross training is not about riding in the dirt specifically or about riding on the street or a race track, it's about all of them � with the season over and the weather turning, it's time to focus on improving our riding skills in an alternate way. It's time to find a new way to keep our skills sharp; this is where cross training comes in. As a new rider I learned quickly there is more to all this riding stuff than just working the clutch and throttle. At 16 years old, I took the MSF beginner rider course. After two short classroom sessions and nine hours of riding in a parking lot, I was blessed to go forth into the world armed with my new found knowledge and skill, fending off a world of distracted drivers and nature's fury. When I took the course in 1989 that was all the training that was available. Even today it is often more training than many riders get. After my formal training, I spent the next few years actively working on improving my skills, challenging myself and learning whatever I could wherever I could. Some advice was good, some was dead wrong, some lessons were joyful, others painful. Soon I had it "ALL" figured out, or so I thought, and like so many other riders I spend year after year adding up miles but never really improving. In my mid 20s I made the move to become a motorcycle safety trainer and soon found I was not nearly as good as I thought I was. It is easy to think you know it all when you don't know what you don't know. The only way to truly learn what you don't know is after you learn it and then reflect back. Like many of you, I do what I can to learn more, read books, take classes, practice my skills with drills, etc. I even returned to riding off-road because of my desire to improve my skills as a street rider. I am a certified MSF instructor for the Basic Rider Course and Experienced Rider Course (called Intermediate Rider Training in Washington), the chief instructor for the Pacific Northwest teaching the Lee Park's Total Control Advanced Riding Clinic, author and head instructor for the Advanced Street Skill program taught at Pacific Raceways, an MSF Dirt Bike School Rider Coach, as well as an instructor teaching an exclusive 2-day adventure rider camp. Recently the synapses in my brain finally fired enough to offer you something that has taken me years to realize. To really become a GREAT rider we cannot limit ourselves to one single focus. A street rider can only learn so much on the street, a racer on the track, and an off-road rider on the trails. The majority of my students are street riders so I often find myself looking for comparisons to help explain why street riders should consider buying a dual-sport/dirt-bike and attend the MSF Dirtbike School. I often convince street riders to do the Dirtbike School by pointing out the benefits like learning how a bike reacts in loose traction and how to control it (do you get nervous when you slip on sand, oil, or painted lines?). But even this explanation comes short at expressing the full benefit of this crossover training. The analogy that I use now is one relating to professional football players. Even if you are not a fan, most people have heard stories of football players taking ballet lessons. I have never seen ballet on a football field but it obviously helps or they wouldn't do it. Football isn't the only sport that does crossover training, why should motorcycling be any different? When a street rider takes to the dirt they gain benefits like increased confidence on loose surfaces, becoming more comfortable moving their body around on a bike (essential when doing advanced riding techniques for the street) , improved balance and mastery of the clutch, throttle and brakes, better low speed techniques and more precision when dealing with obstacles, hills, etc. So let's take this one step further� it should be obvious by now that dirt training, street training, track schools, police riding schools, etc., can carry value back to whatever you ride. Let's simplify our goal for improvement into two categories: mental & physical. I have found myself running out of motorcycle events to improve my riding and now look outside of the motorcycling industry for extra help. Snowboarding is one example of a cross training activity that I do. Snowboarding is one of the least natural things I have ever done; so being put into a situation where I had to really work for something was good to keep me humble. Snowboarding is not natural for me so I often scare the @#$$%% out of myself by just looking down a hill (the good thing is gravity always gets me to the bottom so how hard could it really be?) . Snowboarding relies on two skills that are also critical to riding a motorcycle, one is vision, second is keeping your body relaxed. Vision is similar to what you do on the bike by keeping your eyes on the horizon and always looking to where you want to go, you are more likely to get there� look down and you get to eat a snow cone! The second skill is keeping your body relaxed. This is not really a physical skill but a mental skill. If you can look down the cliff�err� I mean hill, you are about to catapult yourself down and stay relaxed even though your brain is telling you that you are about to die, it is easy when you get back on the bike to apply that same skill in situations like a corner that tightens up or something in the road. In these situations, tightening up your body only makes things worse by slowing reaction time and reducing traction by bracing. Other activities similar to this can be skiing, whitewater rafting, rock-climbing, mountain biking, or kickboxing ( not a self-defense class but a true fight in the ring). How about some other ideas like jet skis: when ridden hard, they respond better when you move your whole body to change its handling characteristics (relates to off-road riding and track riding well). Sea kayaks: I picked these up so I could do something relaxing with the family. It didn't take me long before I decided to learn to roll them. Funny thing when you are upside down in the water� if you don't stay calm and relaxed the boat won't roll. You also learn to use your whole body to control how it acts. Again there are lessons to take to the bike with me. Try spending some time at home blindfolded while doing things about the house. This is a great drill for visualization and increases your awareness of other senses such as sound and smell. Learning to control your mind and fear is way more challenging than any physical skill. If you are not into doing extreme activities or do not have the time or physical ability, you can gain value by exposing yourself to other "tense" situations like going on a rollercoaster that scares you or doing one of those monster swings. The key is to learn how to to stay physically relaxed even though you are stressed or scared. One of the drills we do during the Total Control Advanced Riding Clinic is a visualization drill where you visualize an action and then close your eyes and do it. This is done to help train riders to pick a turn point and then look to the next point of interest while still turning on that point without looking at it. I accidently stumbled on a visualization drill one night. I got home late with my family fast asleep so rather than turning on the lights all through the house, I closed my eyes to block out whatever light there was and proceeded to finish my nightly activities without light (the biggest challenge for me was avoiding the booby traps left by my daughters). I had greater success than I thought I would and repeated a similar drill the following evening working in the pitch dark even though I didn't have to. How does this relate to riding you wonder? If I can create an image in my head to negotiate my house then I sharpen my mind's ability to store other images that I can negotiate without looking at when riding, such as a turn point or apex. Visualization could also be looking ahead and visualizing getting over some boulders on your dual-sport, riding a lap at the track, or completing a turn on the road before even beginning the turn. Your brain doesn't care if it is motorcycle related or not, it just needs to create a mental image and follow through with a physical action. We just need to train it to overcome instincts like tensing up when it senses danger and fulfill the need to visualize actions before we complete them. It is up to you to cognitively connect these activities to your skills as a motorcyclist. 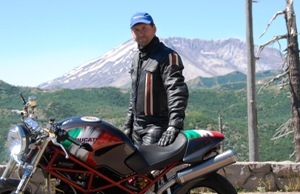 Bret Tkacs is the owner of Puget Sound Safety , a northwest motorcycle training company providing a wide variety of riding courses.